Please contact the owner directly @ 605-670-1466 or twillroth@hotmail.com…2005 Rinker Fiesta Vee 250 for sale. We bought this boat in the late summer of 2012. We are the third owners. We&#39;re selling to go a little bigger. Always stored indoors and serviced annually. It&#39;ll sleep 4 adults comfortably. The front bed converts to wrap around couch w/table. 2 biminis w/full camper enclosure. large swim platform that sits at water level. all bilge pumps work great. New bottom paint last year. There&#39;s more to list, but if you&#39;re interested you can check it out for yourself. I just replaced all the seals and gaskets in the head. I also replaced the shower bilge pump, fire extinguisher and horn. Everything on this boat works great except the wiper. It needs a new motor but I never use it so I haven&#39;t replaced it. Included is a matching 2005 Trailmaster tandem axle bunk trailer with disc surge brakes. It has freshly polished aluminum wheels and newer tires. It has a matching spare with good rubber. It&#39;s on the water in Halsted Bay. I can meet late afternoons or weekends to show it, or I can drive the boat to an easier location on the lake for you if you want to see it. We can take it for a cruise. If the posting&#39;s up, it&#39;s still for sale. 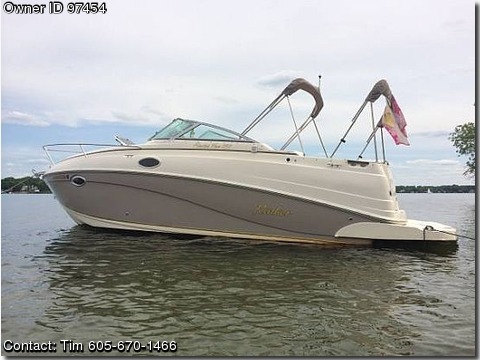 rinker, sea ray, searay, cruiser, crownline, glastron, wellcraft, cabin, Larson, four winns, formula, chris craft, bayliner, regal, chaparral, carver, Trojan, maxim, yacht, cuddy.